Cursed by the drivers who had to follow the trend to one-person-operation. Cursed by the mechanics who had to keep poorly-developed vehicles on the road. Cursed by the passengers who had to endure cattle-truck conditions if one actually arrived. The mid 60's saw the start of an experiment with high-capacity single-deck vehicles in central London and some of the New Towns. Revolutionary new concepts of automatic fare collection were part of the plan. The Red Arrow service between rail termini was a success - unlike the vehicles - but the distorting effect of the Government's Bus Grant scheme resulted in a fleet of 650 Merlin buses being ordered almost before the prototypes had entered traffic. The Merlin was London's first large, rear-engined single-decker, and they were not a success. If they worked at all, their 36-foot length made them difficult to drive in traffic, and shortcomings in the bodywork design led to fatigue cracking. Eventually some of the problems were sorted out and the Merlins worked for a bit over a decade - only just seeing off the much older and much-loved RT and RM buses (in the country area, anyway). There is some confusion about the name. AEC called the London version a Swift 691, but LT adopted the Merlin name of the planned export chassis version and stuck with it. Shorter vehicles on the Swift 505 chassis were indeed called Swifts. The first experimental batch of 15 vehicles should have been split with 6 multi-standing XMS going to the central area for the new Red Arrow, and 9 XMB for the country area. Since union pressure prevented operation of the XMB class, all but one were hastily converted to XMS for the successful Red Arrow. This last became XMB15 and entered service at Tring after being used for demonstration and training for almost two years. The XMB/S vehicles were bodied by Strachans and were more angular than the subsequent production bodies by MCW. The Merlin was intended for both conventional one-man operation and automatic revenue collection, Turnstiles were provided for flat-fare operation in the central area, and Autofare machines on high-intensity urban routes in the country area. Accordingly, the MBs were dual-doored and conventionally-seated for 45 + 15, while the MBS were of 'multi-standing' configuration seating only 25 in the rear saloon, but with standing room for 41 in the front. 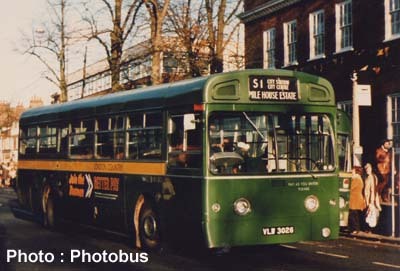 Due to resistance from the drivers' union, only 13 of the MB vehicles went straight into service at Reigate in March 1968 as they were regular one-man buses. Later in the year 8 more MBs entered service at Amersham and High Wycombe, replacing RTs. In February 1969 the remaining MBs were deployed at Garston and Hatfield garages. In November 1968 the first MBS vehicles (271-6) with Autofare apparatus started work at Reigate. The AUTOSLOT MkIIA machines were fitted at the front of the saloon, but there were no turnstiles. The offside machine dispensed pre-printed 3d (thruppenny) tickets, while the other dispensed 6d (sixpenny) tickets. The maximum fare was one shilling, the minimum being 6d, and children travelled at half-fare. From 15th February 1969 Autofare MBS vehicles started operation on town routes in St.Albans, Watford and Hemel Hempstead. 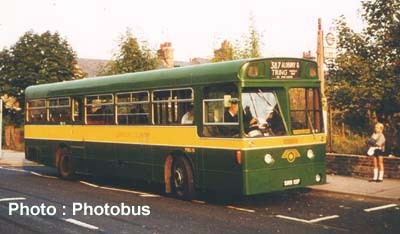 Garston buses had AUTOSLOT MkV machines fitted. The offside machine would accept 3d and 6d coins (thruppenny bits and tanners, no conversion will be supplied here), while the nearside machine accepted 6d and 1/- coins (tanners and shillings). Previous maximum fares had been 1/-, but Watford's 346 had a 1/6d fare. The machines differed from the previous version in that the fare was printed on the ticket face rather than being issued on pre-printed stock. In March, 27 further MBS buses with MkV equipment entered service from Windsor, Northfleet and Harlow garages where they replaced RML and RT vehicles. The cost of converting machinery of dubious reliability when decimalisation came on 21st February 1971 was sufficient to bring an end to the experiment, the MBS vehicles became conventional OMO, and eventually gained seven single seats in the lower saloon. Later, the same vehicles would be used with fareboxes in the urban networks of Hemel Hempstead and St.Albans, thus achieving a decade late what had been started in the first days of operation! All it took was a mindset that did not regard a ticket as a sacred item. The shock to passengers, used to comfy RT and RMC buses, of sending out multi-standing MBS vehicles with all of 32 seats on routes like Hitchin's 303/A can be imagined. At this point I have to state that I liked them (I was only 14 when they appeared in Hitchin) and travelled throughout the network by Rover ticket to seek them out. I was very sorry to see them replaced on the 303/A by boring and uncomfortable Leyland Nationals. London Country Merlins outlasted their central area counterparts, apart from the Red Arrow MBAs. The first casualty was MB101 which cremated itself at Bucks Hill Bottom while working a 318A on 25th September 1970, the remains being written off in November. 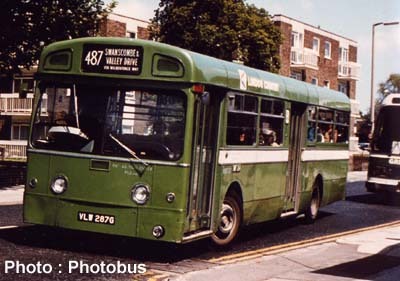 In 1980, only Dorking, Guildford, Crawley and Northfleet had any allocation, but by November only MBS424 at Northfleet and MBS415 at Crawley remained. 20th November saw the last withdrawn from Crawley. Newer Swifts lasted only until the following April. Merlins do survive in preservation, although there is only one green example - watch out for MB90 - which is also unique in having the low driving position. This vehicle moved recently to the collection of Ensign for their new museum after years of restoration effort. Click here for the 'Full Monty' on Merlins courtesy of Ian's Bus Stop. Back to the Vehicles Index.